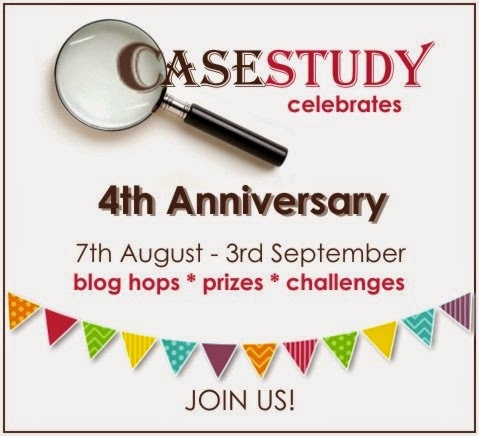 Crafting Confessions: Party time - CASE Study stylee! Party time - CASE Study stylee! Now as you may know, my recent career change has meant I'd recently taken a little break from CASE Study. However, from today I am b.a.c.k.! Yup, I might be crazy but I'm jumping back on board and will hopefully (fingers crossed!) be back to my regular Friday-Eve CASE Study blog posts. These birds have a map detail on them. I love that idea! And from that moment, I had the idea to combine the two and create my own bird embellishment with a typewriter font. It was so easy to create with the help of Olive (our beloved typewriter). I simply typed some words on my typewriter, die-cut the bird from the typed paper, covered it in Distress Ink and then smothered it in Glossy Accents. I addd texture to my background by splattering it with Distress Ink mixed with water and stencilling parts of a distressed-style stencil with embossing paste. This concept works for so many occasions. Simply type any adjectives relating to the occasion. No typewriter? No problemo! Simply use a typewriter-style font on your computer. The acetate helps to ground the bird whilst the positioning of the stars helps the eyes to frame the bird. Well that's all from me today. But there's plenty more hopping to be done as your next stop is Michelle Williams. Thanks for stopping by today! Fabulous card.. and great tips. Stash using is a bonus for sure! I can't even begin to describe how much I love this. Suffice it to say that I am totally captivated by all the amazing details...there is so much for the eye to take in. I adore this card! I love what you ended up with by mixing together your two inspiration pieces!! That looks so fun, I must try it! Adorable little bird by adding typewriter font and wonderful textures!!! Love all the gorgeous texture on your card. From the glossy accents to the embossing powder. Perfect. Finally, are you really coming back for good?? WOO-HOO!! Such a cute card, Aimes! And I'm so glad you're back from "holiday" to rejoin the CASE Study team. :-) Have you seen the work of artist Geninne Zlatkis? She made a series of birds with map details (and a whole lot of other gorgeous birds), just beautiful! Great accents on the bird. Makes him the star. Such a fun and sweet card. Love the typing on the bird die cut and the texture. Great card! Thanks for the awesome tips and tricks too!! Fab card. Great texture and colours. Love the text on the bird. 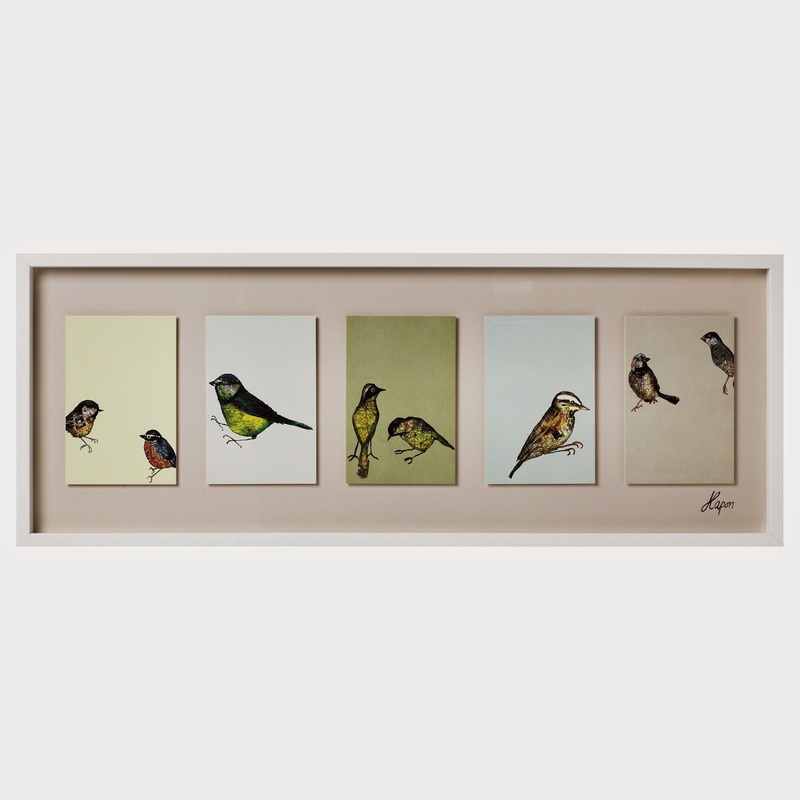 Aimes, this is a cool twist of Ikea birds pictures! Love your tips about adjectives using and acetate grounding the bird. The acetate strip really helps the composition, but does not interfere with other elements! Smart tip! I adore this card!! Thanks for sharing your tips and tricks, too! Love the color combination and the mixed media. Texture on cards is so much fun! Oh wow! it's so beautiful! Aimes!! Love your creation, and your inspiration items... might mean a trip to Ikea for the birds?! Sweet card! Love the typing on the bird. Means I don't have to try to realistically paint it. Brilliant! ADORE your card and use of a real typewriter to make your bird diecut stand out. The embossing paste background is perfect for this lovely card. Love the differing textures and materials you used! They all went so well together! Love all the texture on your card! Fantastic mixed media style card. Love the textures and that blue bird! I have some books that I've been using for various projects. I see a few die cuts from them in my future. Fabulous inspiration. Lovely use of color and texture. I totally have that same hambly goodness...and yes, I'm hoarding it. Beautiful card! I love all of the gorgeous texture! Great inspiration and love how you combined them on your card. Hot dawg...am I glad to see your return. And you've done it with a big bang. Using those prints is kinda brilliant...but typing on that bird is genius. Great card. Love the soft colors and all the lovely texture. I love the typewriter font! Adds so much character to any image! Thanks for the idea! So stylish I love your card! Love the texture and your bird! I love the tiny details on this card! Amazing. Your card is so sweet, love all your details. Lovely card! So glad you're back. Love the acetate and yep, using yup the stash, all good! Loooove your arty card-very very cool! beautiful!!! I love this bird!! awesome!! What a cool idea! Love the way you tailored the sentiments on the bird to fit the card theme. I love the texture on your card! Love the bird!! Great idea to use your typewriter. I'm glad that you're back and always look forward to Friday eves. You kept the background in a really good harmony even though there's quite a lot going on. This is totally adorable!! I LOVE the type on the bird and your use of the acetate!! 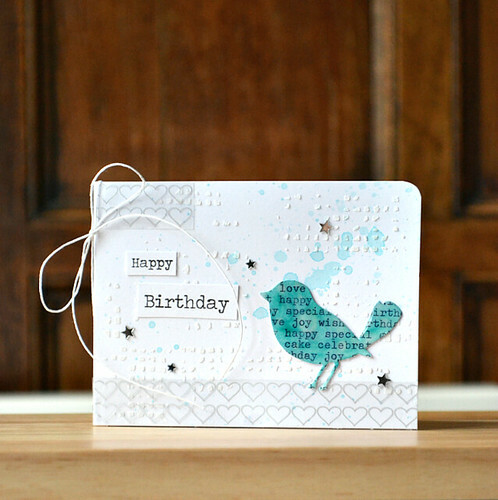 Great job using an inspired purchase to create your card- I love that little bird! Very cute, lobe the bird! what a clever card - beautifully done! Lovely card and calm colors. Fabulous card! I love that sweet bird and the colors you used! Also some great texture! Omg ...your card is just gorgeous ..I just love everything about it ..Its perfect !! SO CUTE!!!!! I love the texture and pale colours! Simple awesome! This card is so cool! Love the bird and the texture and all the darling elements. This is one idea I must incorporate very soon. I really admire this one! I think this card is so cool. I just love the texture and the bird and all the sweet elements on it. I am quite inspired to do something like this, too. Stunning! I really, really love this card! The type writing is awesome and the colour gorgeous! Love! Great colours elements and textures! I really enjoy seeing what inspired you to create this pretty card! I love the typewriter fonts on the bird, and especially the embossing details! Artsy and ultra cool! Beautiful card! Cool card reminds me of art journaling. I like your combination of two inspiring elements. I love the unique inspiration and the card! This is great...thanks for the inspiration! Cool project. Gorgeous and beautiful made. Thanks for sharing. Oh I love this card so much! Such a lovely card! 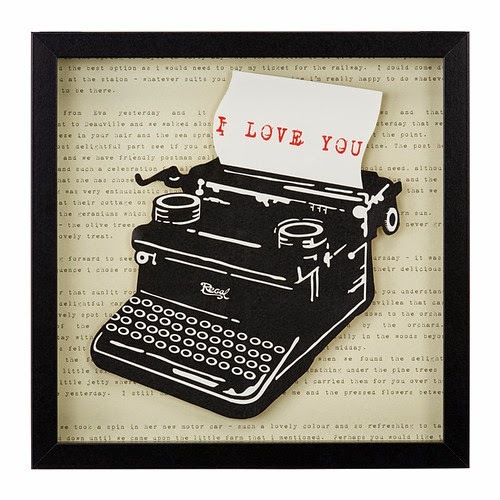 I love your card.What a neat idea to use your typewriter.Love the stencilling too.Wonderful! Fabby card design! Love the textured background and string, and the bird looks great with the typewriter font on it! Artsy take on the inspirations from Ikea!! Hi Amy, I love your bird...yes that typewriter font on it is really great!! Great card. Thank you for the tips! This card is AMAZING!! Love all the texture and the airy color scheme! Thanks for sharing your creativity and tips. It really is a stunning card !!! This is a different idea - the more I think about it I am really loving it. I can use this idea with many different shapes as an embellishment. THANKS! Love that great bird and what great texture and splatter on the background! Love all the texture, and as a fan of old typefaces I really like that aspect too. Lovely card and beautifully created. Love the typewriter font on the bird and the distressed background. Your card is so fun. A perfect take on your inspiration photos. I love your card with the typed covered bird. Love your inspiration, too! TYFS your creativity and inspiration with us! Love very much the visual texture of the typography (from an actual typewriter!) 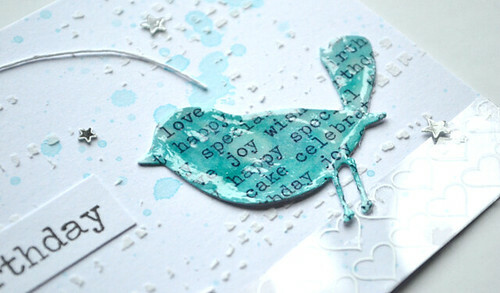 as well as the bits of embossing paste,,, and who can resist such a cute blue bird?! So perfect card.. :) Love it! A wonderful card with lots of inspiration, really good job. I generally love cards that feature birds but I have to say that this one is exceptional!!! There are so many things that I love about it, I don't know where to begin - the colour choice (perfect), the typewriter text on the bird (brilliant), the stars (amazing)... thanks so much for sharing! Your creativity is amazing, Amy!! Lovely! Cute card! Love the bird and the splatter technique. I love the typewriter font! Reminds me of the days! Love the texture of your card. Love the words on the bird and the artsy feel to the card. Such a cute card. I love the typing on the bird and that background looks really great too.